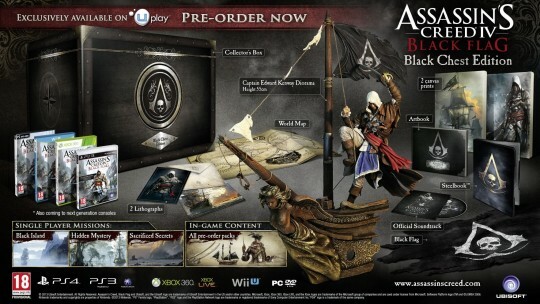 Dr Jengo's World: AC IV Black Flag's Collectors Editions Revealed! Decided to check out the CE forums on the way to work and surprise surprise.. the AC IV Collectors' Editions for Europe have been revealed! The text on the pictures isn't very clear so I'll just do a brief description on the items in each edition. I'll post a link down below for the full details. 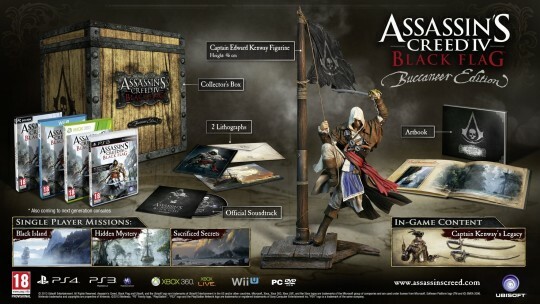 The so-called Tier 1 of the Collectors' Editions - Black Chest Edition. Of course, let's talk about the Figurine first. 55cm high diorama of the new Assassin, Captain Edward Kenway. This is huge! The previous figurines from the CEs are at most 25-30cm. At 55cm, this is going to tower above the rest but should still be roughly in scale since the ship base is rather high. Will be a fantastic addition to my collection. As with previous Assassin's Creed CEs, there's going to be 2 Lithographs. Really like their artwork so will be nice to have these. 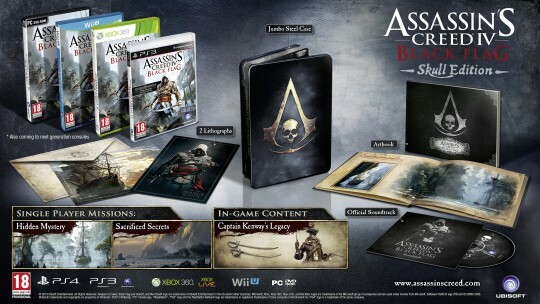 There's going to be a Steelbook too, with the new "Assassin's Creed - Pirate Emblem. Simple blackground but black is classy! There's going to be World Map, assuming it to be the map of the in-game world. A Flag of that AC-Pirate emblem as well. So you can tie it to your boat when you go plundering. There's also going to be 2 Canvas Prints of what looks like Edward Kenway and Captain Blackbeard? Last but not least.. there will be extra DLC content. All these will come in a Collector's Box which I'm not going to get my hopes up about thinking it's made of plastic. Probably good quality though. All in all, it's a fantastic CE to own. No hesitation I'm getting this. The second tier (at least in pricing) is the Buccaneer Edition. Apart from the different Collector's Box, this looks like a lesser version of the first. No SteelBook, Map, Canvas Prints, Flag and less DLC content than the Back Chest Edition. Don't be fooled, the Figurine that comes with this edition is a variant of the first one. In this one, the base is different. Instead, Captain Kenway is standing on the top of the mast. (I'm bad with ship parts so hope I got it right..haha!) This edition will stand at 45cm only, but still huge. A slightly cheaper version for those who aren't interested in the extra content the previous Edition offers but still worth the price. For the variant figurine, will be getting this too but I have a feeling this figurine will be with the US Collectors' Editions so will wait for the US reveals. The third will be called Skull Edition. No Figurine here and nothing exclusive to this edition which isn't in the other editions so will be skipping this. Still has the 2 Lithographs, SteelBook, ArtBook and Soundtrack & some DLC so for those who aren't interested in the other fancy stuff, this should suit you. Nothing collector-worthy here. This is for those who are only interested in playing the game and not into collecting. 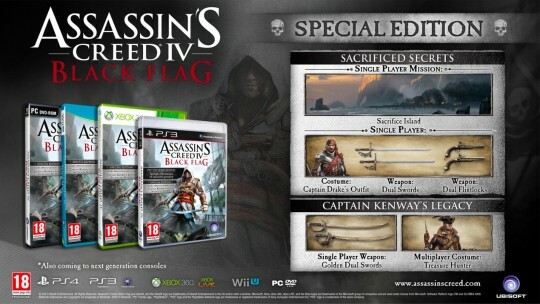 Extra DLC Content for free, the Special Edition will replace the Standard Edition for the same price. So these are the 4 that have been announced so far for Europe. U.S should see their own CE(s) in the coming weeks. That Europe and U.S will have their own online battles on which Edition is better. Asia should have their own poor-man's CE announced a month before the game's out when the real collectors have already pre-ordered and paid for the overseas ones. Australia might see their own CE or come with bonus pre-order bonuses and then everyone makes a new Aussie friend. Each European country/major retailer will have their own PO bonuses ranging from Pirate hats to underwear.. AC IV Collecting has begun my friends! It's that time of the year! Definitely some fantastic content with this year's CEs. Something for everyone. Glad to see that the franchise going strong and hope it will go on for years. There's definitely plenty more stuff to be revealed before the game release. Collecting has never been this fun with any other franchise. When Oct 29/Nov 1 comes around, it's going to be Assassin fever all over again! Check out the link below for detailed info on each CE!